Good afternoon to the captain and crew of Mustang Sally! I msut comment after having recieved your email. The shotski looks to be a useful tool to ensure boredom on the high seas won't take hold. 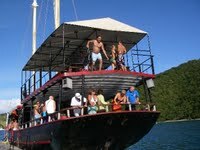 However, I have sailed on this fine ship and never once did I feel the party needed a kick-start to get going. From what I recall, which is not much it, started at the dock and never stopped. 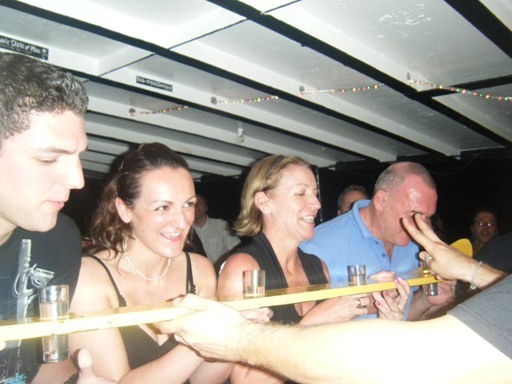 The shotski, I believe, will have a multitude of uses; it could be used to welcome your guest upon boarding, or as a morning kiss to shake off the festivities from the previous night, could also be used for the removal of swim wear, could be used not just to get things started but could be used to ensure things continue, or if over used, could insure things could end, could be used as a gesture of kindness or a peace offering. 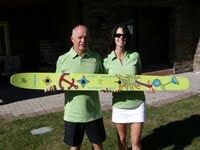 Let me just say "Welcome to the Shotski!! and let the games begin!" Woo Hoo! very sastisfied past (and future) guest. For those of you who have been here you know exactly what I am talking about. This bar is the best party bar I have ever been to. I don't know why exactly, perhaps a combination of things. People are on holidays when they come here and so are ready to let their hair down (or tops/shorts, as they case maybe), maybe that's why. Or perhaps it is because the Willy-T (as it is affectionately known) is on Norman Island and so you can only get there by private boat (there is no ferry). Or maybe it is because of the great music pumping out of the speakers. You can't help but dance to it. Also, the bartenders are the best. Todd, Zeus, Simon, Al .... So charming, fun and extremely helpful when applying temporary tatoos in all manner of places, especially on pretty ladies. (Guys you put on your own tatoos!). The last but certainly not the least important reason the Willy T is the best party bar I have ever been too.... me! Whenever we go a party seems to erupt. I wonder if it has to due with me enjoying all of the above to the max? So, maybe next time you are there you will find the crew of Mustang Sally kickin' it up a notch... and don't worry what happens on the Willy-T stays on the Willy-T...... most of the time. P.S. check out the photo album behind the bar.... see if you can spot me.